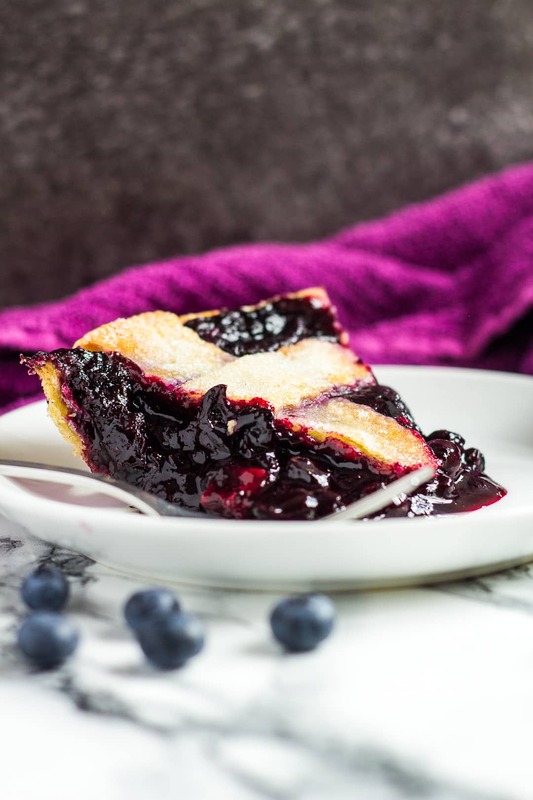 Homemade Blueberry Pie – A deliciously flaky, all-butter pie crust filled with a sweet, homemade blueberry filling! 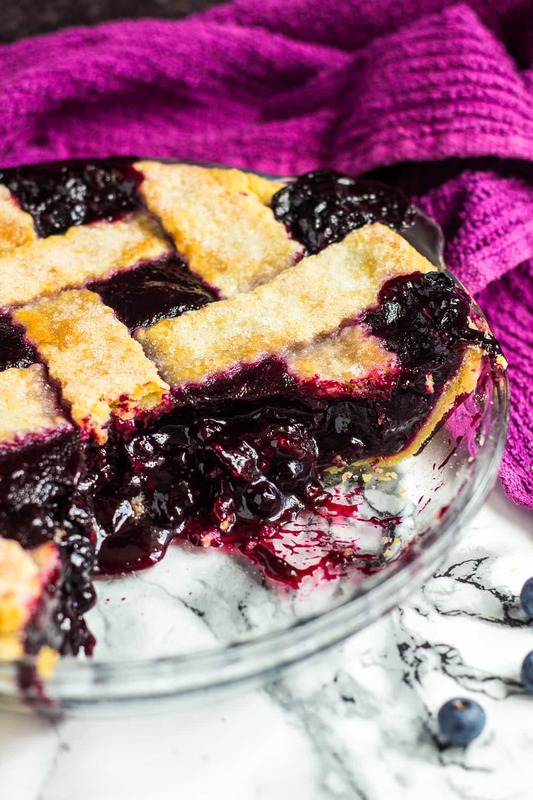 I hope you’ve been enjoying my Homemade Cherry Pie recipe, because today I bring you another scrumptious pie to serve up this summer – I bring you my Homemade Blueberry Pie! This pie is made completely from scratch, just like my cherry version. The crust is all-butter, and incredibly flaky. 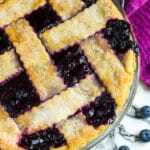 The blueberry filling consists of only a few ingredients, and produces a deliciously sweet, and thick pie filling. 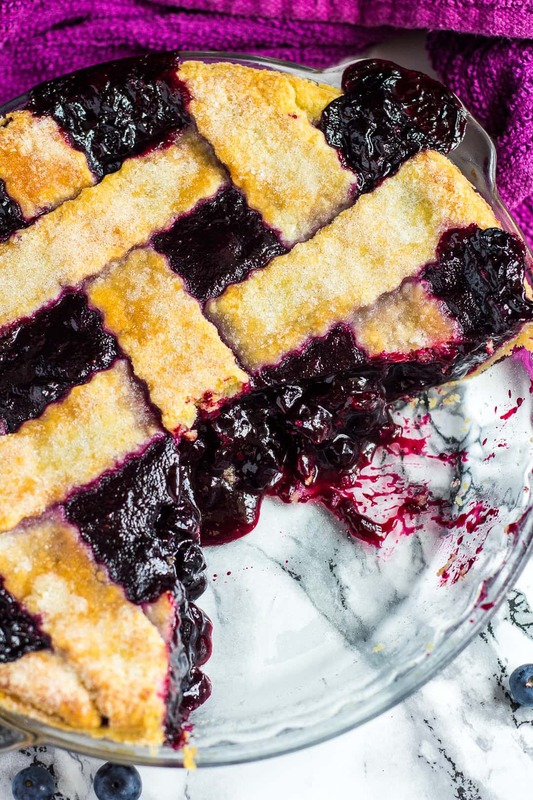 If you love pie and blueberries, you need to make this. This pie received rave reviews from my family, and I’m sure yours will love it, too! To make this pie, simply prepare my pie crust recipe through to step 3. Place the blueberries, sugar, cornflour, lemon juice, and cinnamon into a large saucepan over medium heat. Stirring occasionally, cook for about 10 – 15 minutes until the blueberries start to break down, and the mixture has thickened. You’ll want a fairly thick mixture so that it will hold its shape when cutting the pie later. Remove from the heat and allow to cool completely. On a lightly floured surface, roll out one of the discs of dough to a 12-inch circle. 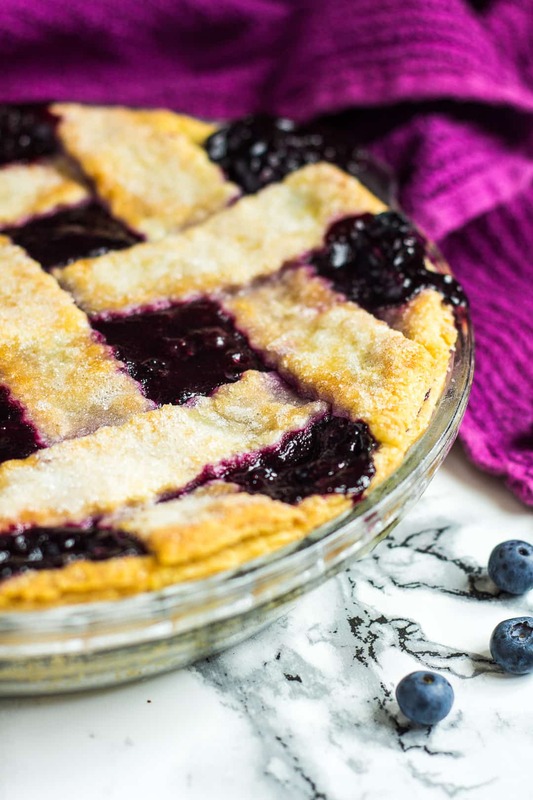 Carefully press the dough into an ungreased 9×2-inch pie dish, then spoon the blueberry filling into the crust. Roll out the other disc of dough to a 12-inch circle. Using a pastry wheel, or sharp knife, cut out strips from the dough. Carefully thread the strips over and under one another on top of the filling. Cut off any excess dough, and seal the strips into the bottom crust. Brush the pastry with the egg wash, and sprinkle with sugar. Place the pie dish onto a baking tray, and bake for 35 – 40 minutes or until the crust is golden brown. Placing the pie dish onto a baking tray ensures the bottom crust cooks through. Allow the pie to cool completely at room temperature before slicing and serving. perfect for all special occasions! How long will this blueberry pie last? This pie and any leftovers can be covered tightly and stored in the fridge for up to 5 days. You can even make it 1 day in advance. After it cools, cover tightly and keep at room temperature. Can I freeze the blueberry pie? Yes! This pie also freezes well for up to 3 months. Thaw overnight in the fridge, and allow to come to room temperature before serving. Try these incredible pies next! Place the blueberries, sugar, cornflour, lemon juice, and cinnamon into a large saucepan over medium heat. Stirring occasionally, cook for about 10 - 15 minutes until the blueberries start to break down, and the mixture has thickened. You want a fairly thick mixture so that it can hold its shape when cutting the pie later. Remove from the heat and allow to cool completely. On a lightly floured surface, roll out one of the discs of dough to a 12-inch circle. Carefully press the dough into an ungreased 9x2-inch pie dish. Spoon the filling into the crust. Roll out the other disc of dough to a 12-inch circle. Using a pastry wheel, or sharp knife, cut out strips of dough. Carefully thread the strips over and under one another on top of the filling. Cut off any excess dough, and seal the strips into the bottom crust. Refrigerate for 30 minutes before baking, and preheat the oven to 200C/400F/Gas 6. Brush the pastry with the egg wash, and sprinkle with sugar. Place the pie onto a baking tray, and bake for 35 - 40 minutes or until the crust is golden brown. Leftovers can be covered tightly and stored in the fridge for up to 5 days. This pie can be made 1 day in advance. After it cools, cover tightly and keep at room temperature. Baked pie also freezes well for up to 3 months. Thaw overnight in the fridge, and allow to come to room temperature before serving. i’m totally crushing on this pie! That filling and crusty top! Yum! The filling looks so delish! Love this pie recipe. The crust looks perfect! 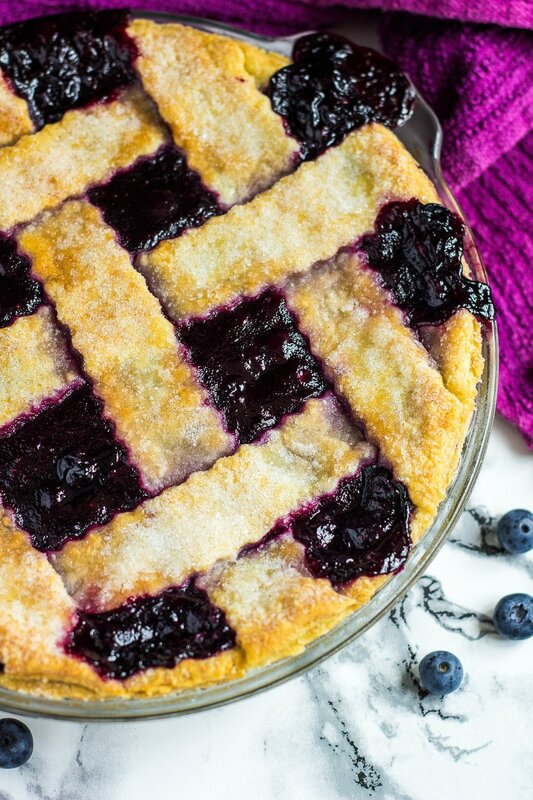 OMG the color of this pie is SOOOO vibrant – I want to lick that pie plate clean! YUM! This is a seriously gorgeous pie! i love your lattice crust too! That blueberry filling looks wonderfully thick, dark and fruity. Loving the touch of cinnamon you’ve added too. 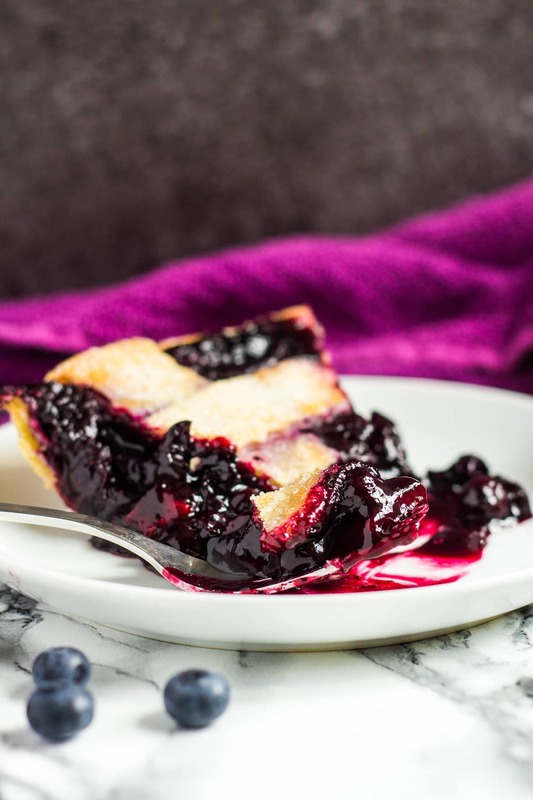 I love blueberry pie and I love how this is completely from scratch! Yum! 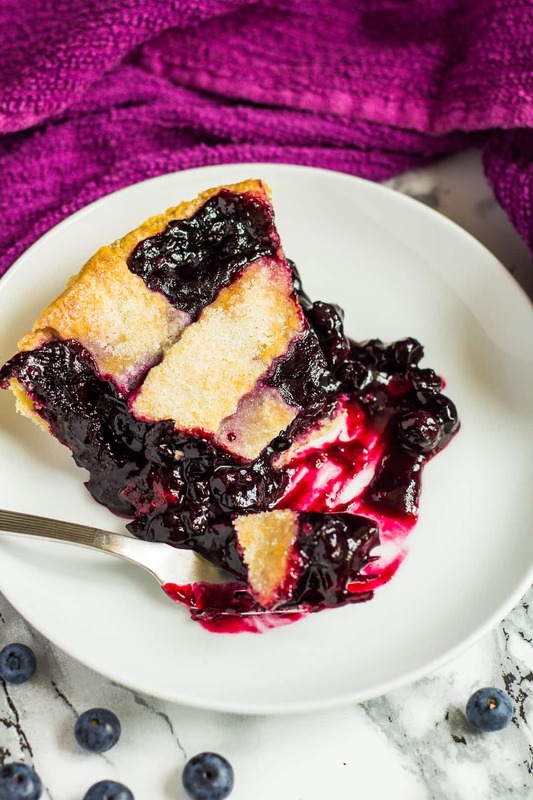 As a passionate lover of blueberries, this pie is my kind of treat, Marsha! Can I use frozen blueberries instead of fresh ones?